The Reading Slump Is Over! At Christmas I had a few guest blogs by authors I had met online and liked for any number of reasons. One of them is AJ Goode. This morning she sent me a request to read and review her upcoming book. Only two kinds of writers ask me to review their books- those that have never read my reviews and those that are crazy. AJ is crazy. Crazy is good. Crazy good. Crazy Goode. Hah! 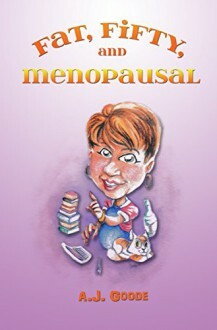 26% into Fat, Fifty, and Menopausal and the almost overwhelming ennui brought on by a stream of not as interesting as they sounded books has dissipated in the warm pleasure of reading the frank and funny outpourings of Everywoman. It’s like having your BFF sit down at your kitchen table, open her mouth and let it all roll out. Seldom has a book spoken so loudly to me, I’m not reading it so much as hearing it. I want coffee and cookies, these conversations need both. There are 19 chapters or, as I prefer, conversations. The conversation about Assholes Among Us is priceless, and Praying For Rain, this woman’s brain must have belonged to Lucy Ricardo.